Waste paper is big business in developed countries. Paper mills require enormous amount of waste paper to recycle. A Chennai-based company, Global Waste Recyclers Ltdis convinced there is a huge opportunity waiting to be tapped. “There is wealth in waste,” says Bharat Pujara, managing Director. It is the largest and the only organised player in this line of business in the country. Just look at the figures. There are 750 pulp and paper mills in India producing many kinds of paper. The installed capacity is 12.70 million tonnes and production is around 10 million tonnes. Forest-based raw materials contribute around 3.1 million tonnes, agro-based raw materials, around 2.2 million tonnes, and recycled waste paper, 4.7 million tonnes, towards paper-making. Waste paper as raw material is environmentally-friendly, reducing solid waste. Demand for paper is expected to go up to 22 million tonnes by the year 2025. However, the present recovery and utilisation of waste in paper mills in India is pretty low. It is only 20% of the total paper and paper board consumed. In Germany, it is 73 %, Japan 60 %, Western Europe 56 %, the US 49% and Italy 42%. India actually imports waste paper as our own stuff gets recycled so many times that the fibre gets lost. Indian mills have come to rely heavily on imported paper waste. The import bill has increased significantly from $5.1 million in 1980 to $1 billion in 2011. Indian paper industry imports 4 million tonnes of waste paper annually-about 57% of its raw material requirements.”Proper and effective recycling will reduce the import bill considerably”, says Pujara. In India only 20 % of waste paper is collected and the rest goes for landfill. Out of 100 kilos paper used, only 30 % comes back for recycling. There are many grey areas in waste collecting in our country. There is a lack of collection mechanism in the offices and the households. Newspaper is used for wrapping and packing. Municipalities do not play an active role in solid waste collection. There are very few paper recyling firms who have warehouse for sorting and bailing waste paper like GWRL does. According to an article in trade paper, Paper Mart, waste management is not taken seriously in the country. There is no storage of waste at source. Only partial segregation of recyclable waste is carried out. There is no system of primary collection of waste at the doorstep. Solid waste is not segregated. Waste is transported in open trucks and waste treatment remains an unknown concept-and waste continues to get dumped in open grounds. 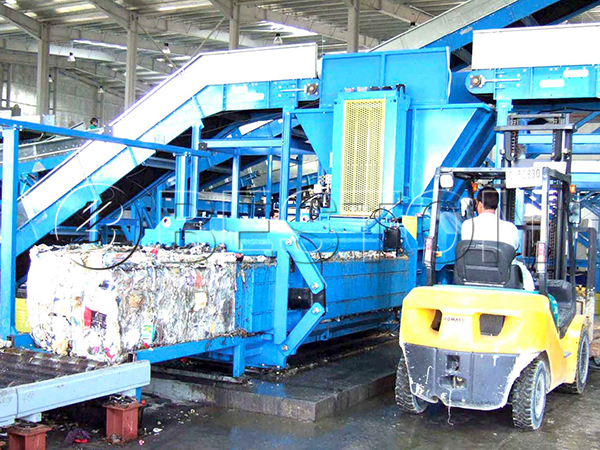 In most of the developed countries, waste collection itself is in the organised sector. They have a wide range of legislation for packaging waste. India needs to implement a system for collection, sorting, grading and utilisation of waste paper to stop imports and reduce raw material costs. “Municipal bodies attempt segregation of various wastes. But nobody follows the rules”, says Pujara. In spite of constraints, the company has seen good growth in the last five years ending up with a turnover of R43 crore last year. It hopes to reach R200 crore in a couple of years. “With costs going up and demand for paper increasing, waste paper recycling is a good business to be in. We are working out different options for raising funds for capacity expansion which requires investment in machinery, infrastructure and storage space,” say the Pujaras.